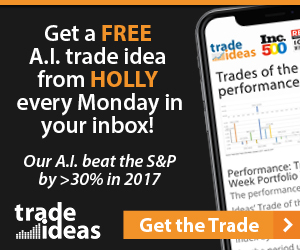 When we look at AI trading, it really hasn’t been around a long time, but it’s certainly changed the way markets are traded today. Markets have always been complex; with multiple participants all trading on different strategies, and all seeing different stories in the charts. So, what has changed since AI Trading (Artificial Intelligence Trading) has popped up on the scene? Any trader who’s been around for awhile can tell you, there is a new breed of participant in the market that is especially dangerous: the algorithmic traders. These traders use computer programs to scan the market for opportunities and swoop in at the right times, cashing in on retail trader losses in milliseconds, before they even know what hit them. In this article, we’ll cover a few ways mathematical AI trading is used to beat the market, and a few ways you can get some edge back from them. BULLBEAR30 – 30% off PRO Yearly or ELITE Yearly plans. BULLBEAR20 – 20% off PRO Monthly or ELITE Monthly plans. Both coupons apply to first 12 months of service, renewals after 12 months are at normal prices. If you purchase the yearly, using the above coupon, you save 30% once for paying yearly, then save 30% again – total of 60% off. It’s a great deal! AI trading algorithms do not have to be of the HFT (high frequency trading) variety to out pace you on the order book. Indeed, many are not. They just have to be faster than you. And most, if not all, are faster than the bulk of retail traders. Algorithmic trading software is used in conjunction with powerful day trading computers designed to beat you at your own game. They’ll be in and out of the position before your chart fully renders on your screen. To them, you’re just a source of liquidity, the real competition is the other machines outpacing their trades. It was estimated that in 2014, over 75% of trading volume was driven by AI trading based algorithms. This number is likely closer to 90% today. With high speed data connections directly into trading exchanges, autonomous decision making made by extremely sophisticated algorithmic trading software, automated risk controls, the ability to do advanced calculus in milliseconds, instant order execution, and near instant profit taking, these algorithms have been engineered and back tested to outperform the average trader. My advice to counter AI trading software may seem counter-intuitive, but I believe it is the best way to trade against the machines: don’t even try to beat them at being faster. Instead, beat them by slowing down. Do this by looking at longer term time frames, and being more patient with your trades. Without a lot of experience and skill in intra-day trading, scalping, and other higher speed trading strategies that are high risk you will struggle and fail. It’s not your fault. These algorithms are programmed to take advantage of human fear, greed and our natural impulses. Very simply they are programmed to target human emotions with math. Instead, take your time to identify trends on multiple time frames before trading. The more cross-time frame trend line alignment you have on your trade, the higher the probability the trade will go in your favor. And if you see strong resistance on your longer term charts, it might be a signal that you should hold off for a bit and wait for a better entry. The faster you try to trade, the less room for error you have and you’re human, so you will make mistakes. Meanwhile, the AI trading software will do their thing no matter what – with precision and speed. The intention of the AI is to lure you into making a quick decision, and thus a mistake. Without hot keys and a LOT of practice, this is a very challenging endeavor. That is why you may choose to swing trade, or even longer term trade to avoid this situation entirely. In this strategy, it’s important to not get caught up in fast pace of one minute candlestick patterns. When slowing down the chart and looking at longer term time frames, you increase your odds of success against the AI trading platforms by focusing on scenarios where the technical setups in many time frames align in the same direction. Practically speaking, next time you see a trend line you like on the 1 minute time frame and want to trade it right away, stop. Check the 5, 15, 60 minute charts. Check the daily chart. Make sure that the majority of the longer term trends align with the direction of your trade. If they do, then return to your normal trade plan and give it some more time to play out. Focus on longer term time frames when managing it. Algorithmic trading software will have a much harder time exploiting your plan this way. Many big institutions will use algorithmic trading software specifically to trick or shake weak hands out of the market. There are numerous techniques used, including intentionally pushing a stock through an obvious support or resistance level to trigger stop losses, faking out the order book to move the price, pre or post market trading, and more. None of this is illegal. Though it may be amoral. The bottom line is – don’t let them get away with their bluff! Remember, thanks to AI trading there is more noise now than there was before, and that’s intentional. Think like a machine! There is no doubt that AI Trading has changed the game. But there are many ways to still turn a profit in this type of atmosphere. If there wasn’t, then what the heck is everyone still trading for! Well, the fact is, 90% of traders do fail. So your training, experience and tools at your disposal are going to make a big difference in putting you in that highly desired 10% spot. You need to find your edge. One way to fight the AI trading and gain your edge is to use some form of algorithmic trading software yourself. TrendSpider is a user friendly automated chart analysis system that uses math and… algorithms! TrendSpiders unique platform will not only analyze charts for you, but it will watch them for you too. Bullish Bears members get 15% off for LIFE by using coupon code BULLISH15. Check it out and put their AI trading power in your corner. BULLBEAR30 – 30% off TrendSpider plans. Discount applies to the first 12 months of service! MONEY FLOW INDEX – WHAT IS A MONEY FLOW INDEX OSCILLATOR?